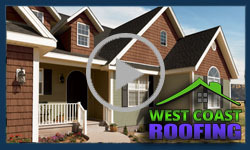 West Coast Roofing specializes in West Linn roof installations! We can help you install all types and styles of roofs for your West Linn area home. Moreover, we will provide you with a wide range of roof installation options and help you make the best decisions for your West Linn roof installation based on your budget, aesthetic desires, and durability needs. Due to the wet weather we experience here in the Pacific Northwest, it’s important to have your West Linn roof installation performed by an expert. Having a technically sound roof installation is critical given the severe weather and greater opportunity for roof leaks that are inherently present in the West Linn area. You can expect West Coast Roofing to not only properly install the primary components of your West Linn roof, but we’ll also ensure that the trusses and rafters are adequate to support the weight of your West Linn Roof Installation. We’ll also carefully install waterproof barriers on your roof along the valleys and around your roof vents and chimneys so that your roof installation will protect your home during the hardest West Linn area rain storms. Asphalt Shingles can be installed in a variety of colors and styles to match the aesthetics of your West Linn area home. Because they are cost effective and fire resistant, asphalt shingles are the most popular roof installation option in West Linn. Metal roofs have dramatically increased in popularity for West Linn roof installations. Metal roofs are low maintenance, energy efficient, and offer outstanding protection in wet weather. Metal roofs are an ideal choice for your West Linn area home. Cedar shakes are another popular option for West Linn roof installations and appeal to homeowners seeking a particular look and to increase the value of their West Linn area home. Tile roofs are made of either clay or concrete and are commonly used in the Southwestern United States, though they are gaining popularity for roof installations in the West Linn area because tile roofs are available in a variety of architectural styles. Slate roofs are incredibly durable and provide excellent protection for West Linn area homes. Slate is a natural stone and is available in various thicknesses. Because slate roofs can last for more than 100 years, they are a good choice for homeowners seeking a long-lasting West Linn roof installation option. Do you need a new roof installed in West Linn? Contact West Coast Roofing today and we can help you with every aspect of your West Linn roof installation!